The Lexus RX is a midsize luxury crossover that will appeal to a wide variety of consumers. We tested the hybrid model with the 2015 Lexus RX 450h, which definitely proved to be a pleasant option during a week of January weather. The roominess and comfort of the Lexus RX coupled with the fuel efficiency of the hybrid model offers a tempting option for consumers to consider. The new spindle grille introduced by Lexus looks great on the RX. It’s not too aggressive, but it certainly adds some much-needed styling to the overall look of the RX. Hybrid fans have to be thrilled that they have so many options these days, and now you can feel good about saving fuel while enjoying the comforts of a luxury CUV. The interior of the RX 450h is very roomy and comfortable, and it’s ideal for families and city driving. Our driving team ran plenty of errands around town enjoying the comfort of this vehicle. The RX now features a standard Display Audio with Rear Backup Camera with a seven-inch monitor. We found it very easy to use considering all the options. It’s all about gas mileage if you’re considering a hybrid, and the Lexus RX 450h delivers nicely. 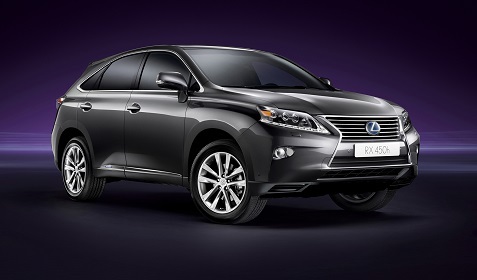 The RX 450h will achieve 32 mpg in the city, 28 mpg on the highway and 30 mpg combined (30/28/29 MPG with AWD). But you’re not sacrificing performance with the RX 450h which the performance of 295 combined system horsepower, with substantial torque at all speeds. Our team enjoyed driving this vehicle in all sorts of conditions. The RX 450h is a full hybrid with an impressive variety of driving options. It can operate in electric-only, gas-engine-only or combined gas and electric modes. The Lexus Hybrid Drive combines a 3.5-liter V6 engine with a front-mounted 116-kW electric motor generator, with a continuously variable transmission. Our model also featured on-demand all-wheel drive which is great in bad weather. Four driving modes can be selected by the driver, including EV, which allows the vehicle to operate on electric-only power at low speeds under certain conditions. Other modes include Normal, Eco and Sport for plenty of flexibility. We were definitely impressed with the responsiveness in Sport mode. In a growing midsize crossover market, consumers seem to have an endless supply of choices these days. There are plenty of options regardless of your tastes and budget ranges. If you’re in the luxury market and you appreciate the value of a hybrid, the Lexus RX 450h offers an excellent option. Drive it and see for yourself.